With a focus on attaining self-sufficiency in the production of food grain, Tripura has embarked on an ambitious programme to bring large swathes of cultivable land in the state under the System of Rice Intensification. The results are promising, writes Ratna Bharali Talukdar. Looking at the healthy grains of his rice crop that have been cultivated using the System of Rice Intensification (SRI; see box for more) method, Kranesh Dev, a farmer in Dukli block of West District in Tripura comforts himself. This year, he can expect surplus food grain, despite a ravaging flood caused by backwaters from Bangladesh that partially damaged his paddy-field three months back. For Dev, a small farmer with only six kanis of land (6.5 kanis constitute a hectare), the SRI method was an experiment, carried out in the hope that he would get an increased crop from his plot. He is one of thousands of small and marginal farmers, who constitute 90 per cent of total farmers in the state, who have adopted the popular 'less seed, less water, less manure, less pesticide and high yielding' SRI method of agricultural practices to be a part of government's approach to boosting rice production in the state. Having been used to "somehow managing two meals, provided everything goes alright", he can now dream of much more, with his yield up 45 per cent despite the flood-related damage. The harvesting season was almost complete, and farmers were busy in post harvest operations when I visited Tripura on 18 December. But Dev was still in his field, harvesting a relatively late cultivation. He was happy to share his moments of joy with India Together. As he stood there overseeing the six agricultural labourers he had engaged for harvesting the crop under the guidance of block level officials of the Agriculture Department, he was convinced that it had been, after all, a wise decision to switch to SRI. "I have six kanis of cultivable land. However, I dared to experiment with SRI only in three kanis this year. The outcome is tremendous. I shall use SRI method in the remaining land also from next year," he says. The distinctiveness of SRI methods involves developing nutrient-rich and un-flooded nurseries instead of flooded ones, single planting of seedlings ensuring wider gaps between them, preference of organic manure and organic pesticides to protect natural environment, a systematic management of water so that plants roots are not saturated and sufficient oxygen is ensured for healthy growth. Seedlings are transplanted singly rather than in clumps of two or three or more. This means that individual plants have rooms to spread and to send down roots. The most labourious part of the cultivation is proper management of water with an appropriate irrigation system that allows water to be "put on" and "taken off" from the field at certain intervals. The system was developed in Madagascar in the 1980s and has been successfully tried in 25 countries across the world. For Tripura, a tiny state of only 10,491 square km and only 2.40 lakh hectares under rice cultivation, SRI may help improve productivity, and eventually help the state attain food sufficiency. To attain food security in food grains and improving economic condition of the farming community, the state government in 2000 adopted a 'Perspective Plan for Self Sufficiency in Food-Grains by 2010'. The current rice production in the state is 6.30 lakh metric tonnes (MT) which is grown in 2.50 lakh hectares of land. The agriculture department has estimated the annual requirement of food grains for 2010 to be 8.22 lakh MT, and is optimistic of reaching the goal thorough SRI practices. 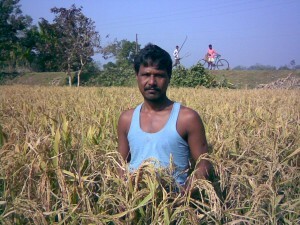 Picture: Kranesh Dev harvesting his paddy grown using SRI methods (Photo by Ratna Bharali Talukdar). State officials from the agricultural department have been helping farmers like Dev raise the productivity of their lands. Baharul Islam Majumdar, senior agronomist at the Department of Agriculture, who has been instrumental in popularising SRI in Tripura, improving the yields through SRI was particularly important because there isn't much additional cultivable land that can be brought under paddy. Initial trials of SRI were conducted in State Agricultural Research Station (SARS) farms by the department in 1999. The trial plantings were evaluated by different spacing, age of seedling, and seed rate per hectare. Following successful experiments with SRI in different rice varieties over 2.5 years, a rigorous field demonstration programme was carried out, aimed at popularising the system among farmers. Within three years of the initiation of the demonstration programme in fields, the department has turned SRI into a mainstream practice. A quiet revolution has spread through the state, bringing the production targets much closer, and also benefiting farmers like Dev in the process. Majumdar told India Together that around 44 demonstration programmes were carried out in 2003-04; this was increased 10 times during the next year. In the year 2005-06 the department of agriculture initiated a large-scale demonstration programme with a targeted area of 16,745 hectares under SRI, and by the following year, 85 per cent of the target was met, covering 74,000 farmers. For 2007-08, the state agriculture department has set a target of bringing 30,000 hectares, involving 150,000 farmers under SRI during both kharif and rabi seasons. It has also set targets to bring an additional 50,000 hectare under SRI in 2008-09 and 75,000 hectares in 2009-10. To meet these, the state government has chalked out a number of innovative methods to popularise SRI; these include research, a sensitising programme, training of agricultural officials, rigorous campaigning, and providing financial assistance to the tune of Rs.4500 per hectare to farmers who adopt these practices. SRI practices work well for small farmers too; in Tripura, where 90 per cent of the farmers hold very small lands - averaging 0.56 hectares each - this is especially important. From early indications, it appears the state is well on course to meet its targets. According to reports from the state agriculture department, per-hectare production of some local varieties of rice using the SRI method has grown 38 to 40 per cent over production by conventional practices during the year 2006-07. A World Wide Fund for Nature (WWF) report on Tripura's experiences with the SRI method projects that with the system the state can easily achieve its target of producing 13 lakh tonnes of paddy (9 lakh MT of milled rice) by 2015. "Tripura is now unstoppable. It is even willing to devote 100,000 hectares to SRI cultivation. If this happens, it could become the first state in the country to produce more rice in an ecologically and socially sustainable way," says Dr Biksham Gupta, Policy Adviser, WWF International in the organisation's publication on SRI practices in Tripura titled More Rice, Less Water. Small State, Big Results. Ratna Bharali Talukdar is a freelance journalist based in Guwahati, Assam. She received the Chameli Devi Jain Award for Outstanding Women Media Person and the Ramnath Goenka Excellence in Journalism Award in 2005 and 2006 respectively. This article has been produced as part of a study facilitated by a grant provided to the author under the TATA-RGVN Senior Fellowship programme.